It seems like every day a new pizza is dreamed up. Unfortunately, they’re not usually available in the US nor vegetarian friendly. 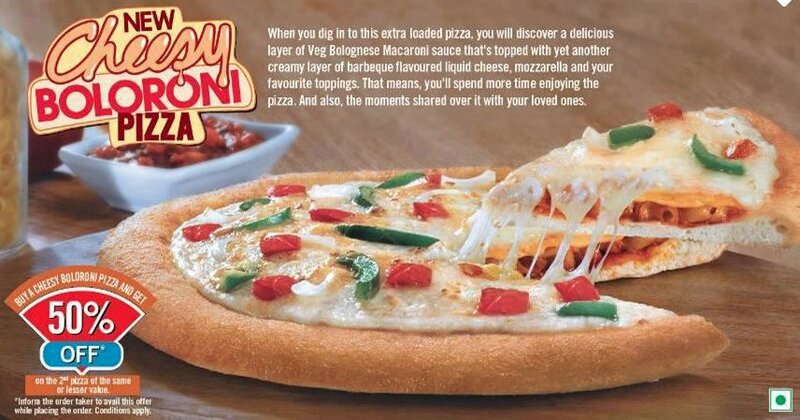 Leave it to Domino’s, in India to create a vegetarian, junk food friendly pie. As the fattest nation in the developed world, you’d think products like these would be marketed here! This newly available Cheesy Boloroni pizza has macaroni above the sauce but under the cheese. The macaroni is in a vegetarian Bolognese sauce (hence the Boloroni name.) The pizza also includes a barbecue flavored liquid cheese.